The Northrop F-89 Scorpion was an early American jet-powered all-weather interceptor. It has the distinction of being the first aircraft armed with nuclear weapons (the Genie missile) for air-to-air use. The Scorpion stemmed from a 1945 United States Army Air Forces specification for a jet-powered night fighter to replace the P-61 Black Widow. Lockheed submitted a modified version of the T-33 to be produced as the F-94A. Northrop submitted a proposal labeled N-24, a slim-bodied aircraft with a cantilevered mid-mounted wing and two Allison J35 turbojet engines with afterburners. It was to have radar and a crew of two, with an armament of six 20 mm cannon in a unique trainable nose turret. Contracts for two prototypes were issued in December 1946. The initial XP-89 prototype made its first flight on 16 August 1948, with test pilot Fred C. Bretcher. A unique feature added to the prototype during development was the deceleron, a two-part aileron that could split open to act as an air brake; this feature was to become a Northrop trademark, still used today on the B-2 Spirit. Production was authorized in January 1949, with the first production F-89A entering USAF service in September 1950. It had AN/APG-33 radar and an armament of six T-31 20 mm cannon with 200 rounds per gun. The swiveling nose turret was abandoned, and 300 US gallon (1,100 L) fuel tanks were permanently fitted to the wingtips. Underwing racks could carry 16 five-inch aerial rockets or up to 3,200 lb (1,455 kg) of bombs. Only eight F-89As were completed before the type was upgraded to F-89B standard, with new avionics. These had considerable problems with engines and other systems, and soon gave way to the F-89C. Despite repeated engine changes, problems persisted, compounded by the discovery of structural problems with the wings that forced a refit of 194 -A, -B, and -C models. Proposed re-engined F-89s, designated F-89E and F-89F, were not built, nor was a proposed F-89G that would have used Hughes MA-1 fire control and GAR-1/GAR-2 Falcon air-to-air missiles like the F-102 Delta Dagger. The final variant was the F-89J. This was based on the F-89D, but replaced the standard wingtip missile pod/tanks with 600-gal fuel tanks and fitted a pylon under each wing for a single MB-1 Genie nuclear rocket (sometimes supplemented by up to four conventional Falcon air-to-air missiles). The F-89J became the first and only aircraft to fire a live Genie as the John Shot of Operation Plumbbob on 19 July 1957. There were no new-build F-89Js, but 350 -Ds were modified to this standard. They served with the ADC through 1959 and with the Air National Guard through 1969. A total of 1,050 Scorpions of all marks were produced. 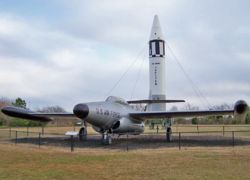 18 complete F-89's are currently on display in the United States. F-89J s/n 53-2547 on display at the Montana Air National Guard, 120th Fighter Group, Great Falls, Montana. This jet fired the live Genie described above. One off prototype to test the Allison YJ71 engine. F-89As converted into drone control aircraft. F-89Bs converted into drone control aircraft. ↑ Knaack, Marcelle Size (1978). Encyclopedia of US Air Force aircraft and missile systems. Office of Air Force History. This page was last edited on 6 March 2007, at 06:27.